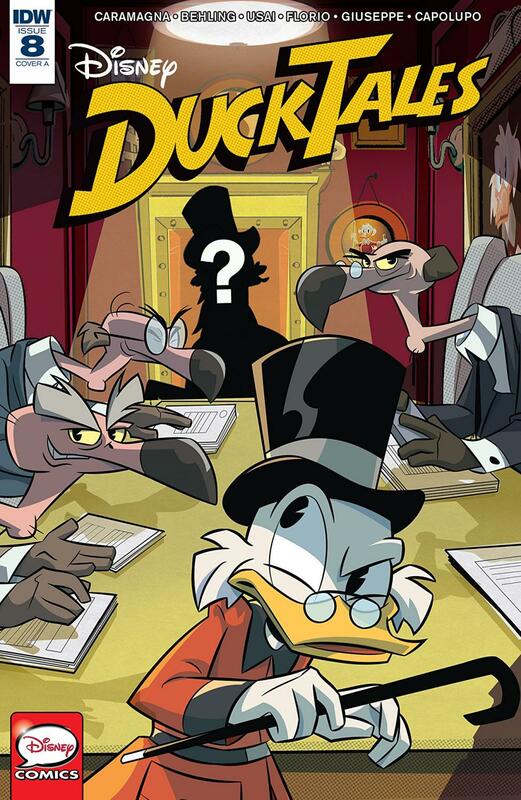 This eighth issue of this DuckTales series is the first issue that I felt was a little disappointing. I have been enjoying this series so much and really think that the stories have been more fun than usual for all-ages comics. But this issue’s stories almost feel like fillers compared to some of the amazing little tales this series has given us. The first story, “The Beast in the Board Room,” is about Uncle Scrooge leaving a rehabilitated villain in charge of his company to show his employees that they should be grateful for how good of a boss Scrooge is. This story did not interest me much at all. There wasn’t that usual humor that Joe Caramagna has been given us in his stories. It kind of just fell flat in my opinion. As usual, the artwork is fantastic in this story, so it does have that redeeming quality. The second story, “Sleep (Walk) of Doom,” again, just doesn’t have the usual freshness and humor that the previous issues have contained. Dewey has half of an ancient coin which is causing him to fight a dragon in his sleep, who will take over the real world if he beats Dewey. This story is pretty fun, but there is nothing here to make me love it. The artwork however is incredible and is just a joy to look at. Finally, in eight issues, this series has released an issue that I didn’t absolutely love. This issue wasn’t fresh or funny enough to excite me like the previous issues did. I have really enjoyed every issue before this issue and will continue to read it as I know that this team can put together amazing and hilarious stories. This was a miss out of a lot of hits, which is disappointing, but I am confident it will be redeemed next month.